This dirt road summit connects the paved roads in Elliot State Forrest with the more isolated south side of the Umpqua River. I think the most interesting stretch is the lower southern approach, the reason - the same as with all the roads in this area: old jungle like forest. In case of attempting to fit this point into a loop ride, it would be an excellent idea to plan for the eventuality that the bridge over Luchsinger Creek is out. From West. I hadn't planned on going up this side, just coming down it. 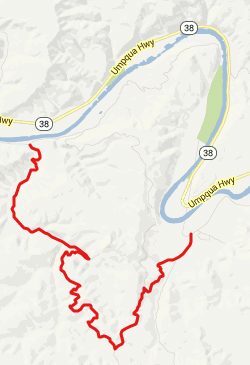 But when the time came to cross Luchsinger Creek and head west along the Umpqua River, there was no bridge that would accomplish this, as shown on the map. I was later told that the bridge was out, and will continue to be out, due to lack of funds. But I couldn't even find a bridge that was "out". I couldn't find a bridge, period. I could have headed east along Butler Creek Road, but on my loop that would have been an even bigger detour. So - consequently - here is the uphill description. Signs label both Butler Creek Road emerging from the brambles, and Luchsinger Creek Road, leading into deep mossy forest. Immediately east of this junction is an abandoned farm house and the biggest wild patch of blackberries, that I have ever seen in my life. I still have a stomachache as I write this. The Luchsinger Creek Road crosses three small green overgrown creeks and follows dark shadows into a tunnel of old growth vegetation. It all ends where the road makes an abrupt right turn (looking back you see a Luchsinger Creek sign pointing left). From here to the top, this is a road through logging country, few clear cuts, many checker board forests of varying age, some thinned forests. Short sections of the road are heavily graveled. Approaching the jct with Bridge Road, far views show how much of the high area has been clear cut. Past the junction with Bridge Road, which gives up its name to Luchsinger Road, the path still keeps climbing, skirting some wild forest again. - Don't think I need to mention any more that there is no view from the top.